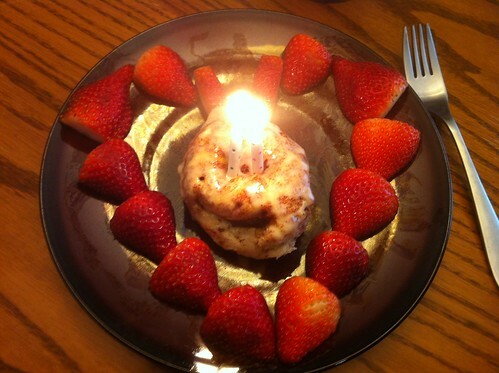 I turned 24 years old on February 19, 2012. I kind of wished I was turning 23 again! 24 is so close to 25 and I feel like that is old! 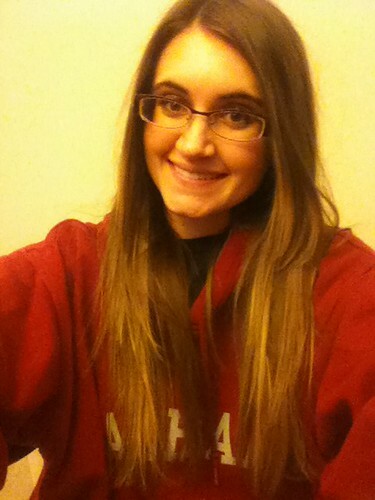 Anyways, the picture above is practically what I looked like on my birthday...but way worse. So imagine that, or not haha. I got a horrible cold a couple of days before my birthday and let me tell you it was miserable. 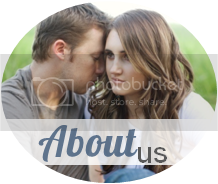 Miserable since you can't load up on meds like you usually do if you are not pregnant. I took 1 dosage of Wahl-dryl...basically I went to Walgreens and had to call a different Walgreens since the pharamacist had already left. That is the only thing I could take really. This was Saturday night. My birthday was on a Sunday and luckily I was able to skip church. Well, Kevin went to church and was hoping to find someone to cover nursery for me. Usually a few parents stay (since their child is getting used to nursery and cries when they leave, etc...) so it would have been fine but Kevin kind of got stranded but luckily it worked out! I was so sick and I really just slept like the whole day and ate a few meals made by my loving husband! Then I went back to sleep while he went to church. After church he made me this for lunch. YES I love breakfast foods!!! 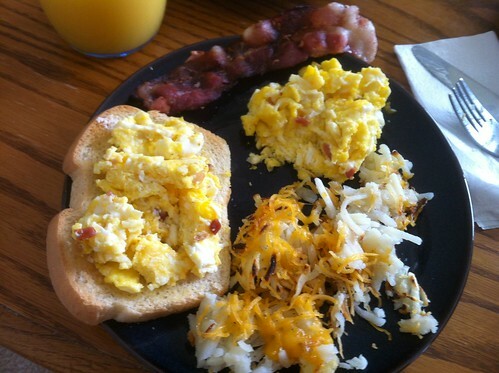 And I always put eggs on toast...da best! 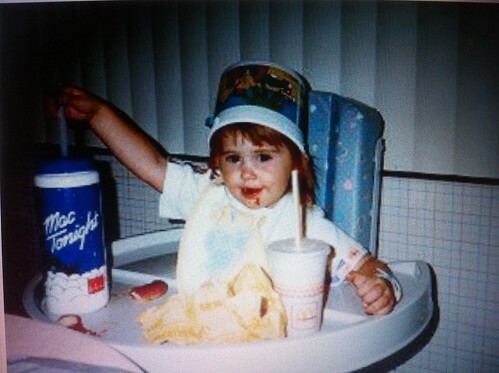 Oh and here is a picture of me when I was a little one! My dad posted it on my Facebook wall on my birthday for some reason lol. Maybe our kiddo will look like me? Or me here? How old do you think I am? 1-3? 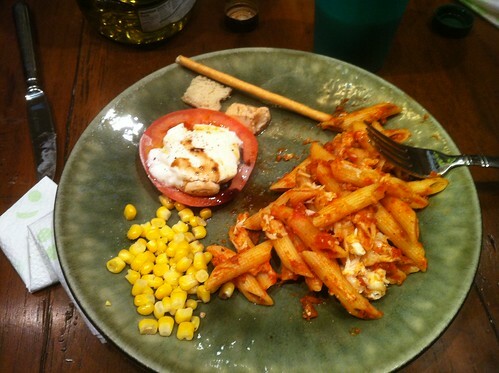 For dinner, Kevin made one of his authentic Italian dinners! Baked pasta, tomatoes with fresh mozzarella and olive oil/balsamic vinegar, corn, bread, proscuitto wrapped bread sticks (griseini? sp? )...don't worry I didn't have the proscuitto! And...there may have been more. For dessert my dad made me German Chocolate Cake, my fav! 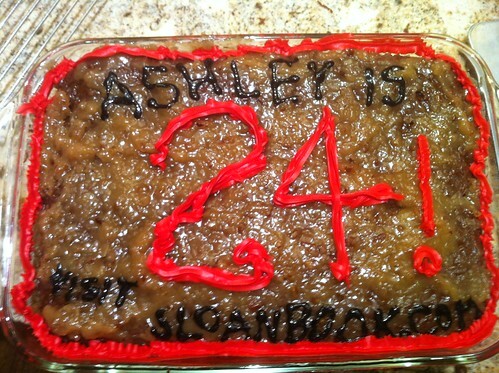 "Ashley is 24! Visit Sloanbook.com"
My brothers Patrick and Hunter got me a gift card to Motherhood Maternity which I already spent! What Hunter really wanted to get me was "Cho's wand" aka Cho Chang from Harry Potter. He is obsessed with Harry Potter and was upset he went in on the gift card with Patrick. He even printed a sign that said, "Cho's wand coming soon!!! :)" It was HILARIOUS. Zach got me a cord that lets me see the pictures from my Canon on my computer which I really needed. Kelsi (my sister missionary in Sao Paulo, Brazil) sent me some dog stationary, a DVD of some pop Brazilian singer chick, and a Baseball bat pen. Omi & Opi took me to see Cirque de Soleil's Dralion at the Budweiser Events Center the week prior. The in-laws got me some money that we put towards the babymoon. My parents got me a Theit camera bag OR a diaper bag...so I am actually debating which to get! I am looking at the Petunia Pickles diaper bags...oh and Kevin and my babymoon was my birthday/Valentine's Day present and my present to him for a few things as well haha. Overall my day was GREAT other than the fact I was a zombie with a cold hehe. PS. 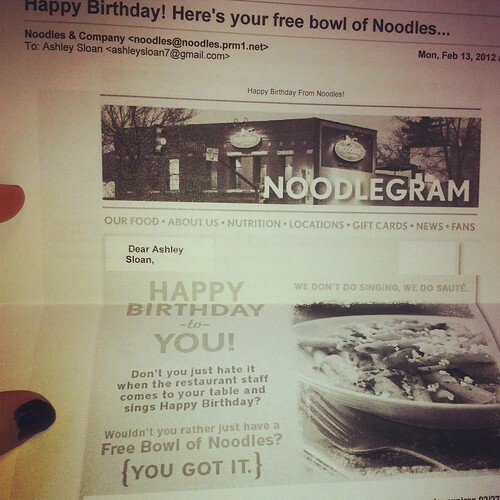 If you haven't signed up to receive promotional emails from Noodles you probably should since they give you a free bowl of noodles for your birthday! 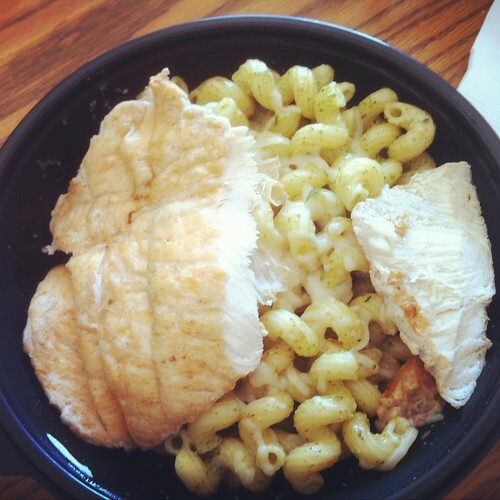 Yep, I got Pesto Cavatappi for lunch for free!!! Awesome. we are the same age! well I will be 24 this year :-) I need to sign up for the noodles program!